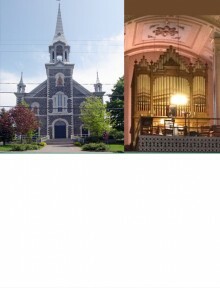 The restoration of the organ at Saint-Paul-Apôtre Church, Chesterville (Centre-du-Québec), is now complete. The Opus 135 of Casavant Frères (1901) will be played by the organist Jean-Willy Kunz on June 4, 2016, at 2 pm, during a special concert. Doctor in organ playing, Jean-Willy Kunz, organist in residence of the Orchestre symphonique de Montréal will be joined by Antoine Gervais, baritone. This concert is being held in partnership with the Canadian International Organ Competition and les Amis de l’orgue des Bois-Francs (AOBF).